We explore the beta release of Corel's headline app, which is making vector drawing even more natural. CorelDRAW is up against stiff competition: it's difficult to recommend it over Adobe’s Creative Cloud, and for the features on offer Affinity Designer is better value for money. Nevertheless, DRAW is an excellent vector illustration tool, with LiveSketch impressing us hugely. Playing second fiddle is never easy. But that’s what CorelDRAW has had to do for many years due to the dominance of Adobe in the creative software space. But even so, since its first release in the 80s (yes, the 80s) CorelDRAW has been a comprehensive vector drawing and illustration tool, each release adding a raft of new features – sometimes aping Illustrator, sometimes innovating over it. 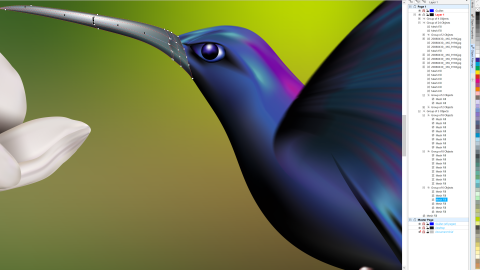 CorelDRAW Graphics Suite isn’t just about the eponymous illustration tool, and it hasn’t been since the early 90s. The ‘suite’, as the name suggests, is a number of tools and resources for everything from logo design to photo manipulation to web design – but in truth you’ll be buying this for the headline app. Bear in mind this initial test was on the beta version of the software, so we’re not going to be looking at bugs, glitches or even speed, really, as we need to wait for the final release. What we can do is run through the features and give you an idea of how useful they are for the professional designer. There’s three main tools in the suite – CorelDRAW, Corel PHOTO-PAINT and Corel Website Creator – plus a load of smaller utilities. CorelDRAW 2017 is a vector drawing application, and a very smart one at that. By far the biggest addition is one that artists will just love. And that’s the LiveSketch tool. Vector drawing programs have long had the ability to recreate natural media effects – turning them into editable and infinitely scalable strokes. But LiveSketch is a bit different. It’s aimed at giving you a natural drawing environment within CorelDRAW, trying to eliminate the need for sketching and scanning. And it’s pretty intelligent. You see, no matter your drawing style, you can get a smooth line: if you’re a scratchy drawer, using multiple small strokes to build up a bigger line, in other apps you’re gonna be left with a number of smaller vector strokes. In CorelDRAW 2017, you can set a timer in the Properties bar (with the LiveSketch tool selected) to determine how long you have to adjust your strokes before that sketched line is converted to vector points. It sounds complicated but it’s incredibly intuitive when using a stylus. It’s a highly original feature and one we look forward to playing more with. Combine this with the new Tablet Mode, excellent stylus support (including the ability to adjust stylus tilt, bearing and rotation in real time) and perhaps a Surface Book or Studio (CorelDRAW supports these natively – as well as the new Surface Dial) and you have a pretty damn cool vector sketchbook. And once you’ve got your vectors down, smarter nodes make for a quick editing workflow. Each node has a distinct appearance depending on the handle or selection type, and the size, colours and shapes of the editing points are customisable via Options. More intuitive interactive sliders for gradients, blends, transparency and so on wrap up a decent release – but it’s really the LiveSketch tool that steals the limelight. It’s worth mentioning the other tools in the suite, most notably PHOTO-PAINT 17. It’s actually a very capable alternative to Photoshop, and if you’re switching over the interface is easy to adapt to. As are the tools, in fact, as they share many similarities with Adobe’s behemoth. New in this version is a Healing tool, which enables the quick editing of blemishes; a Perspective correction tool that gives you a grid-based dialog to fix distortions in photos; and a Gaussian Blur lens – a paintable mask that enables you to blur areas of your images non-destructively. There’s quite a bit going for PHOTO-PAINT; its creative tools are solid and its typography options excellent. There’s other stuff here as well. Are you ready for the list? There is also 10,000 clipart and digital images, 2,000 high-res photos, 1,000 fonts, 350 templates, 2,000 vehicle templates, 500 interactive frames, and over 600 fountain, vector and bitmap fills. Yes, we told you there was loads here. How useful most of it will be to you is another matter. It’s worth noting that Corel is offering two ways to pay for the software – an Adobe CC-like subscription that will cost you £30 per month, or a one-off licence for £600. If you own a previous version of CorelDRAW Graphics Suite you can upgrade for £300. Whilst CorelDRAW itself is going to be the app that perhaps makes you reach for your credit card, the entirety of this suite is pretty good value – just look again at the extensive list above if your eyes can take it. It’s difficult to recommend it over Adobe’s suite of tools due to the omnipresence of Big A. If you need to do a job that’s going to be worked on further in say, Illustrator, there’s always going to be a discrepancy of file and your client may not appreciate that. And in all honesty, it’s even harder to recommend CorelDRAW on its own over Affinity Designer, for its price to features ratio. We really wish you could buy CorelDRAW on its own, perhaps for the same price as a one app Adobe subscription, as it’s a very powerful app.